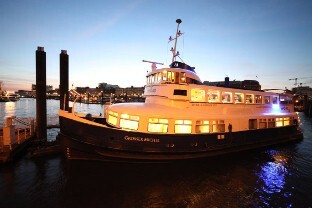 The Grosser Michel is available as a Charter Boat, as a wedding ship for your sophisticated party, meeting or your client events. The Event Ship is both traveling north across Germany as well as lying firmly at our berth in Hamburg and offers far more flexibility than any other ships of its size. We are able to cater your event event for up to 80 people. 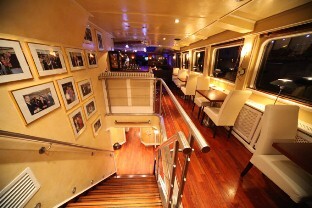 The aft deck is well separated from our lounge area. Whether as a convertible in good weather or heated well in winter, dining, lounging, or celebrate in a unique setting and in any weather, on your personal cruise along the Elbe River aboard this beautiful traditional ship. 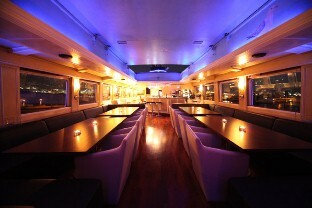 Here you can dine elegantly as needed, but it can also be converted to a dance floor. The ship Grosser Michel is mostly Event and charter boat in motion, you can also stay on board as well. On board we offer you 5 comfortably furnished rooms, each with shower / WC and an unobstructed view of the Elbe. At the bar and lounge you can enjoy a drink with the beautiful view over the harbour. On board there is also a small gym and spa area including sauna and plunge pool.